Is the NCD you&#8217;ve chosen worth the risk? Is the NCD you’ve chosen worth the risk? Non-convertible debentures (NCDs) have been the flavour of the year 2011. 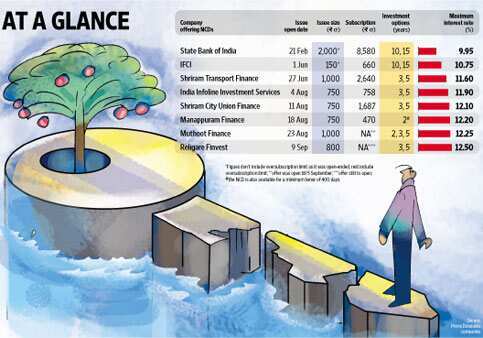 So far, at least seven NCDs, most of them from non-banking financial companies (NBFCs), have hit the market. The latest in the list is NCD from Religare Finvest Ltd, which got announced on Monday and is open for subscription from 9 September (see Page 17 for product analysis). One basis point is one-hunredth of a percentage point. Earlier in the year, the State Bank of India NCD (February 2011) offered a maximum return of 9.95% per annum for a tenor of 15 years; in June, IFCI Ltd went slightly ahead and offered up to 10.50% per annum for its 10-year NCD; and Shriram Transport Finance Ltd (in June) and India Infoline Investment Securities Ltd (in August) gave 11.6% and 11.9% per annum, respectively, for their five-year NCDs. More recently, Manappuram Finance Ltd and Muthoot Finance Ltd are offering a maximum of 12.2% and 12.25% per annum, respectively. Muthoot’s NCD was open for subscription till Monday. In keeping with the trend, Religare Finvest is offering a maximum annual return of 12.5%. With the Bombay Stock Exchange’s Sensex yielding a negative return of 8.28% in the last one year and even bank fixed deposits (FDs) offering returns a notch lower (9-9.5%), NCDs are looking good. But you need to dig out a little deeper to understand whether NCDs are really worth your money. Retail investors need to remember that market investing is only for the long term, so near-term volatility may not affect their returns. In the fixed return category, one needs to keep in mind a very important differentiating factor between FDs and NCDs—the level of risk. While FDs carry minimal risk, NCDs are a high-risk instrument. Banks are lending to NBFCs at higher rates owing to increasing policy rates and the classification of NBFCs as the non-priority sector (except microfinance institutions) by RBI. NCDs help NBFCs to borrow from the public at lower rates (the yield offered on NCDs). Compared with yields of around 12%, banks are lending at about 14-16%. So it works out to be cheaper for NBFCs, but attractive for the investors. By issuing NCDs, NBFCs are also able to diversify their loan book so that in the extreme event of systemic liquidity drying up they can rely on funds raised from retail investors (during the liquidity crisis of 2008-2009, NBFCs faced difficulty in raising funds from banks). The returns are certainly higher but so are the risks. If a company defaults, you run the risk of losing your entire investment. While AAA-rated NCDs do not offer much more than bank FDs, lower rated NCDs offer better returns. For instance, SBI NCD which was rated AAA/Stable by Crisil Ltd offered 9.95% for 15 years, while IFCI Ltd which was rated LA by Icra offered 10.75% on the same tenor. The main risk that NCDs carry is the company going bust. While there is no fool-proof method to predict the future of a company, looking at the ratings of the NCD and assessing a company’s health can be good indicators. Ratings: Based on the financials of a company and the quality of assets it holds, independent rating agencies, including Crisil Ltd and Icra Ltd, ascribe a rating to companies as well as NCDs. The higher the ratings, the safer it is for investors. While RBI permits only “A" rated NBFCs to issue NCDs, there is no such rule applicable on manufacturing companies. Despite having a poor rating, they may raise funds from the public. Promoter credibility: The information on promoters’ credibility may not be readily available. Also, if the company has raised funds from the public in the past, check whether it honoured its commitment or not. The websites of the registrar of companies and corporate affairs ministry may help you find out whether the company has defaulted in any way in the past. As a thumb rule, avoid companies with a dubious record. Nature of NCD: There are two types of NCDs—secured and unsecured. A secured NCD is covered by assets owned by the company, while unsecured NCDs may not have assets marked against it. In the case of default by the company, investors in secured NCDs have a better chance of recovering their investments, though there is no guarantee as such. “Unsecured NCDs would offer high rates compared with secured ones but risks are much higher in unsecured ones. Investors should stay away from unsecured NCDs even if it is from a government-owned company," says Anil Rego, CEO, Right Horizons, a Bangalore-based financial planning firm. However, the company first pays off essential dues such as its provident fund contribution for its employees and income-tax dues. It is possible that the company is left with no assets after settling the dues, in which case even holders of secured NCDs stand to lose their investment. For instance, the recent NCD offering from Shriram Transport Finance was a secured one, while IFCI’s issue was an unsecured one. While Muthoot NCD closed subscription on Monday, Religare will be open to the public in a couple of days. But your options are not limited to just one company. You can subscribe to an NCD through two channels: primary and secondary market. Primary market: Buying from the issuer directly is called a primary market transaction. The rates offered are fixed till the time you hold the bond even if there are interest rate fluctuations in the market. Most NCDs are issued on a first-come-first-served basis, so be an early bird if you are interested in an issue. Secondary market: But if you missed the bus, you can enter the secondary market and buy through the stock exchange or from a broker or an individual. However, buying through the secondary market is not so simple and you need to understand the nitty-gritty involved. When a bond is first issued (in the primary market), it offers a fixed interest rate. The rates depend on the credit rating of the issuer as well as the prevailing interest rate at the time of the issue. If interest rates fall, new bond issues would offer a lower coupon rate. In contrast, if interest rate hardens, coupon rates too would harden. However, in the existing issue, in which the coupon rate remains fixed, the bond price changes to offer competitive rates. Bond prices rise when interest rates fall and vice versa. Let us understand how this works in a rising interest rate scenario. Suppose bond A carrying a coupon rate of 10% is issued at a face value of ₹ 100. In other words, the issuer will pay ₹ 10 every year as interest. If interest rates rise to, say, 11% and new bonds offer that rate, investors won’t be interested in bond A offering 10%. In such a scenario, bond A’s face value would fall so that the rates become competitive. The discounted price will be ₹ 90.90. The reverse will happen in a falling interest rate scenario—the face value will increase to give a lower rate. So, in order to buy from the secondary market, you need to pay the prevailing prices of the bond. For instance, the SBI bond, issued earlier this year at a face value of ₹ 100, was trading at ₹ 103.98 as on 30 August on the National Stock Exchange. “The interest rates have almost peaked and yields have started softening now. That’s why SBI NCD’s price has increased," says Ganti Murty, head (fixed income), Peerless Funds Management Co. Ltd.
Costs in secondary market: You need to pay brokerages and taxes, including securities transaction tax, if you buy through the stock exchange. Challenges in secondary market: Trading volumes in debt market is usually low and bonds of your choice may not be available at a given point. “The trade volumes are less and whatever trade takes place generally takes place in bulk. So, an investor willing to buy 10 bonds of a particular issue may not get anything," says Y.S. Narang, head (fixed income), Unicon Financial Intermediaries Pvt. Ltd, a broking house. Also, not all issues are listed on the exchanges. But you still have the option of buying from a broker or individual directly. In general, such individuals charge you higher brokerage, beside service tax. But buying NCDs in physical form exposes you to fraudulent practices since prices won’t be transparent. Hence, we suggest you do not buy bonds in physical form. If you are satisfied with the risk profile of the company issuing the NCD and are looking to earn slightly higher returns than FDs, you may look at NCDs. Investing channel: But stick to the primary market and stick for the term to get the returns fixed by the company. Entering the secondary market is difficult and we strictly advise against buying through brokers or individuals directly. NCD options: Look for a put option, under which you can tender back your NCDs after a time frame set by the company. However, if there is a call option, wherein the company can recall the NCDs, consider the date when it is entitled to exercise the call option as your likely maturity date. Diversify: Invest only a part of your portfolio in NCDs. “For someone who wishes to invest predominantly in debt, say 65%, the proportion for NCDs may remain close to 10-15% while for someone who only invest 25% in debt, they may invest close to 5% in NCDs," says Rego. Worth the risk? It is also important to look at the net returns since the ticket size is small for retail investors. “Assume an NCD is offering 2% higher than the banks FD rate. But if the investment is, say, ₹ 50,000, the net extra gain would be ₹ 1,000. One needs to consider whether he can risk his entire investments for a small gain of ₹ 1,000 on a yearly basis," says Gaurav Mashruwala, a Mumbai-based financial planner.